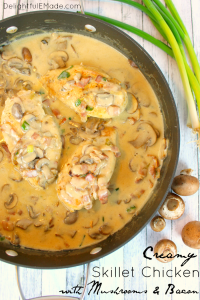 These Ranch Chicken Tenders are the perfect dinner solution! Do your kids eat chicken tenders like they’re going out of style? 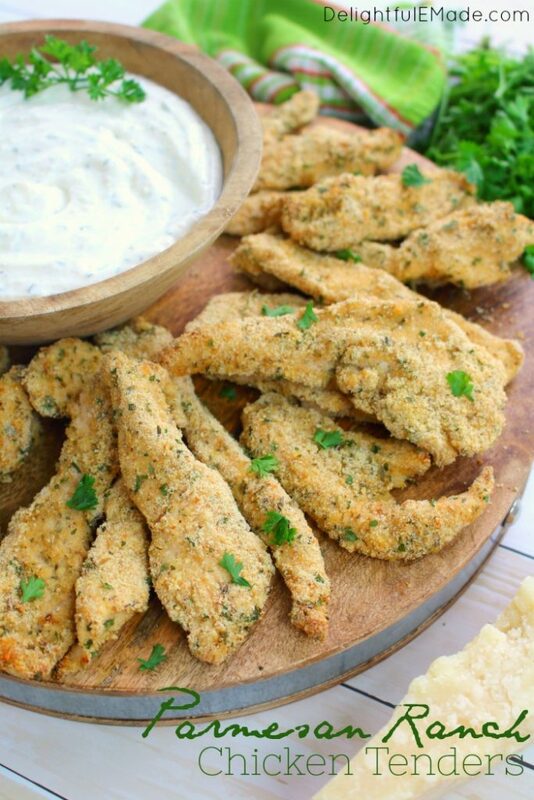 Then these baked Parmesan Ranch Chicken Tenders are definitely for you! 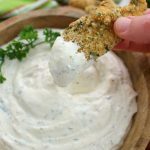 Baked with a Parmesan ranch coating, these chicken tenders are easy to make and come out of the oven crispy and loaded with flavor! If you have kids, or grand kids, you likely know that they tend to really love chicken tenders. My son, in particular, could eat them for breakfast, lunch and dinner if I let him. 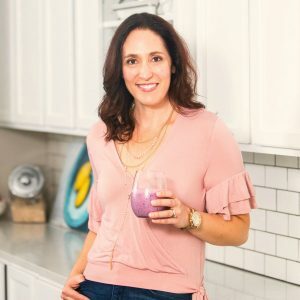 The fact of the matter is, while I occasionally buy the frozen ones from the grocery store, I know that baking our own chicken tenders is much healthier. 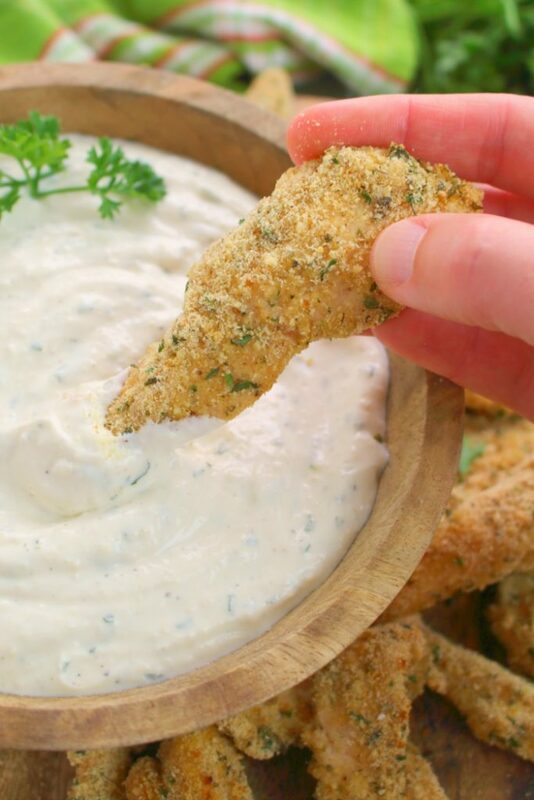 I’ve finally come up with an easy recipe in these Parmesan Ranch Chicken Tenders, that uses regular chicken breasts, and is coated with Parmesan cheese and ranch dipping sauce making them really tasty. Best of all, my kid and his friends attest that these chicken tenders taste awesome! Because I buy frozen chicken breasts in bulk to save a few dollars, I like to use them wherever I can. Yes, you can purchase the pre-cut chicken tenders, however, I personally don’t prefer them. Cutting tenders from boneless, skinless breasts takes just a few minutes, and you get a slightly larger tender depending on how you slice them. 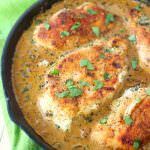 For this recipe you can use about 2-3 breasts. 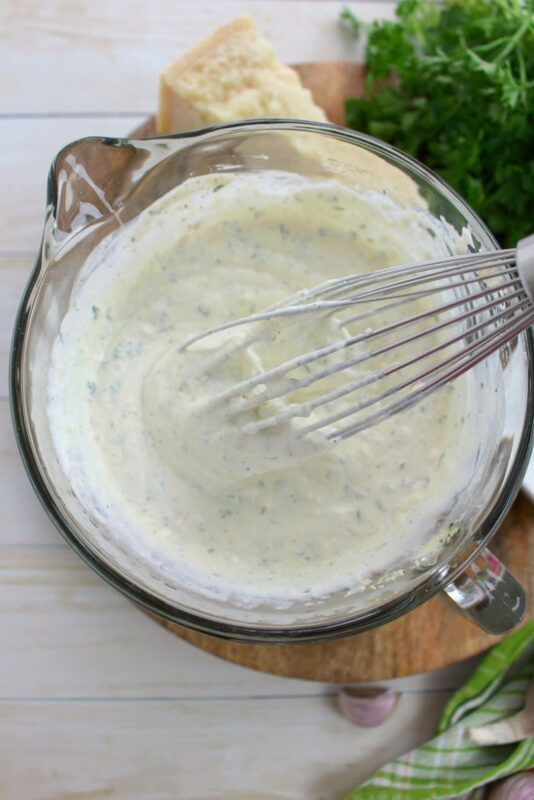 As you’ll see in my previous posts, I made this super yummy Parmesan Ranch Dipping Sauce. 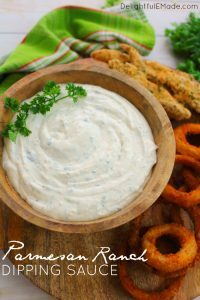 I will often mix up a batch of this sauce, and keep it in the fridge in a mason jar for dipping everything from fries and onion rings to marinating these chicken tenders. 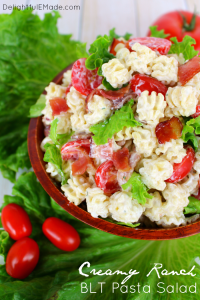 You’ll quickly discover that this sauce adds some amazing flavor to anything its paired with. To a resealable plastic bag, add about 1/3 cup of dipping sauce, along with the cut chicken. In the bag, squish the chicken and sauce together to coat well. 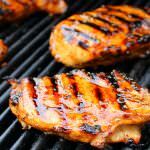 You can actually prep this ahead of time, and refrigerate and marinate the chicken. 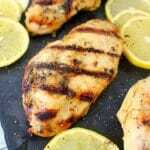 It will really add some awesome flavor to your tenders the longer the chicken marinates. 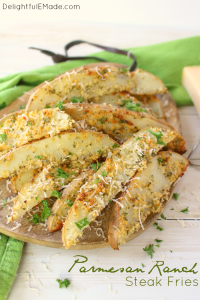 In a shallow bowl (a pie plate works really well), mix together the breadcrumbs, Parmesan cheese, dried parsley flakes, salt and pepper. Next, begin coating the chicken tenders on all sides in the breadcrumb mixture. Shake off any excess breadcrumb coating. 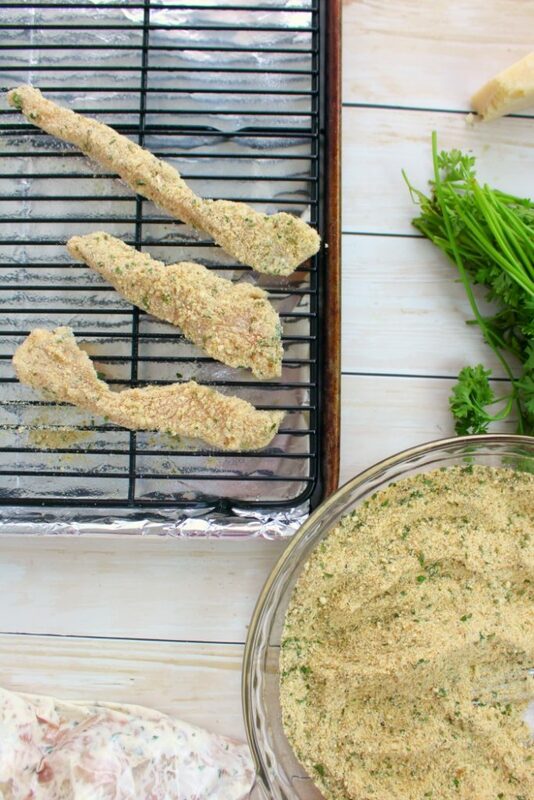 Once the tenders are coated in the breadcrumbs, place on a prepared baking sheet. Through trial and error, I’ve discovered that a pan lined with foil, and a baking rack works the best. The foil helps with clean up, and the baking rack helps keep all sides of the chicken crispy and to cook evenly. No soggy crust here! Bake the tenders at 400 degrees for approximately 18-20 minutes. Step 6: Serve and Enjoy! Once the chicken tenders come out of the oven, they’ll be crispy, flavorful and ready to enjoy. 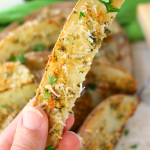 Serve with additional Parmesan Ranch Dipping Sauce for dipping. As I mentioned earlier, my son and his neighborhood pals quickly ate this entire batch of chicken tenders. 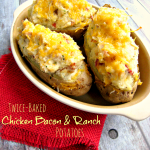 These tenders are fantastic for a weeknight dinner, and are also great for enjoying as an appetizer, too! Do your kids eat chicken tenders like they're going out of style? 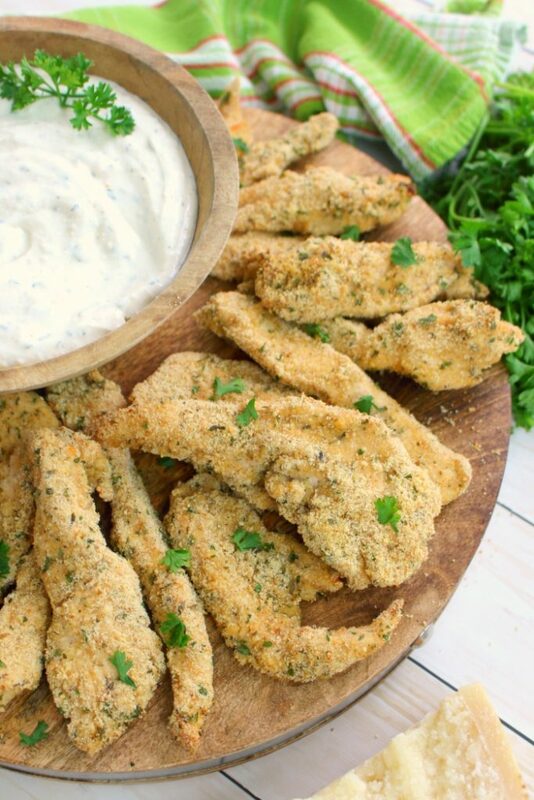 Then these baked Parmesan Ranch Chicken Tenders are definitely for you! 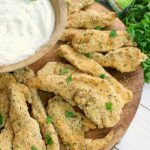 Baked with a Parmesan ranch coating, these chicken tenders are easy to make and come out of the oven crispy and loaded with flavor! Preheat oven to 400 degrees. Line a large baking sheet with aluminum foil, and fit with baking rack. Lightly spray with non-stick cooking spray. Set aside. 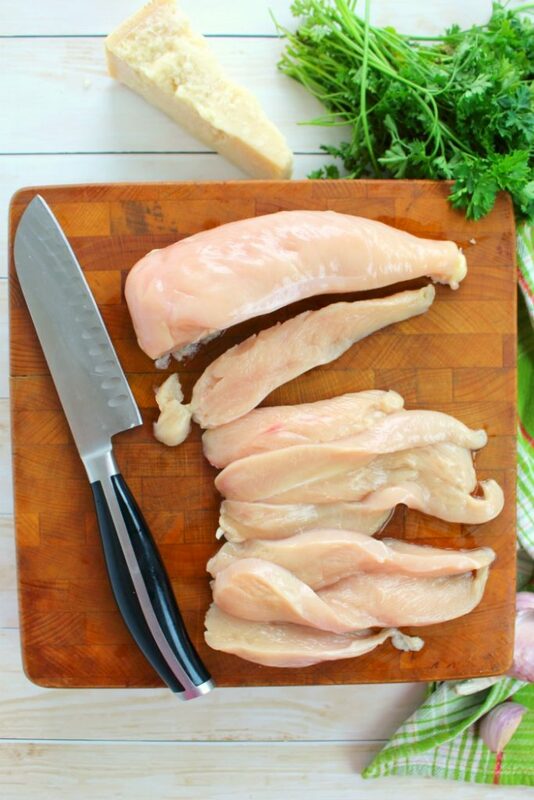 On a cutting board, slice the chicken breasts into 1/2" tenders. Place sliced chicken into a resealable plastic bag. Add the Parmesan Ranch Dipping Sauce, and coat chicken well. 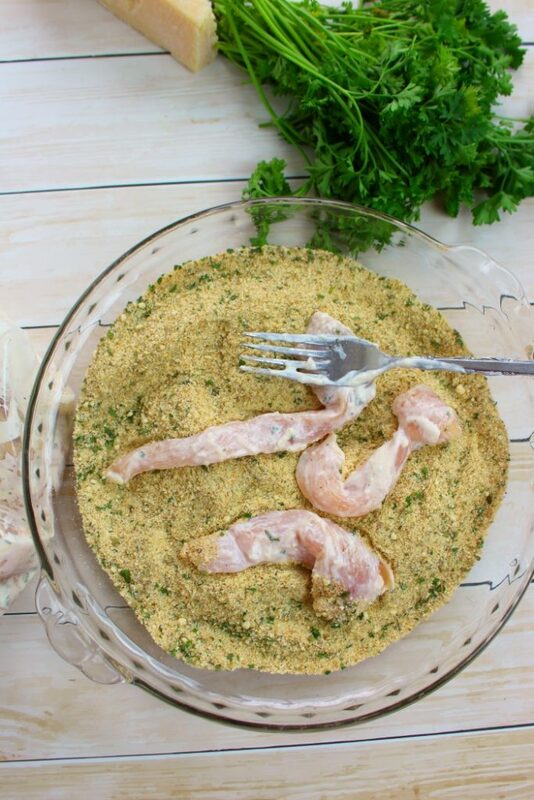 In a shallow dish (a pie plate works well), add the breadcrumbs, Parmesan cheese, parsley flakes, salt and pepper. Stir together to combine. With a fork or tongs, add the ranch coated chicken to the breadcrumb mixture, and coat all sides. 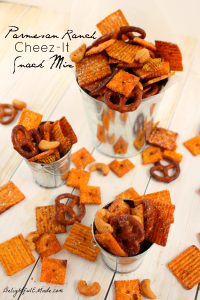 Shake off excess crumbs and place on prepared baking sheet. Bake chicken tenders for 18-20 minutes, until golden brown. Remove from oven, and serve with additional Parmesan Ranch Dipping Sauce. Once the chicken is removed from the resealable plastic bag, be sure to discard any remaining ranch sauce that is in the bag with the raw chicken. Do not consume this.